Almost a year ago I reviewed certain Arch books (published by Concordia Publishers) at 5 Minutes for Books. When I saw that Concordia was releasing some new titles this year, I was curious to take a look at them. I remember owning some Arch books when I was younger. In fact, I remember when my mom would take me to browse the Christian book store in the town where we lived, I would always take a look at the spin around rack that housed Arch Books (alongside Happy Day books.) I don't remember which titles we specifically owned, but it's been fun to introduce my own children to them. 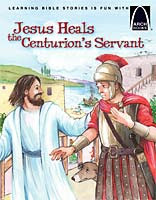 Each book focuses on a particular Bible story, character or parable. The stories are told in rhyme, each like one long poem. Concordia has published a great many of books in this series and you can see a complete listing of Arch books here. The illustration style various by book and by story. 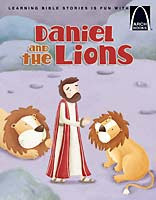 For example, in Daniel and the Lions the lions are more cartoon like in nature, making them seem a little more gentle and a little less ferocious (which is something we very much appreciate as it makes Bible stories approachable at this age, without being scary.) 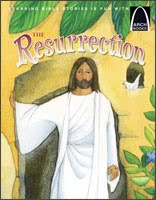 The illustrations in The Resurrection, however, are more classic in nature . If you are looking to introduce your children to the Bible, Arch Books may be able to help you do that (if you can get into the rhymes, I think you are safe!) They are definitely worth checking out and I'm happy to have had a look at their latest titles. Thanks, Concordia Publishing House, for the opportunity to take a good look at Arch Books! 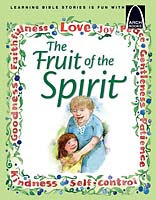 These books are an awesome resource for parents of young children and I appreciate the offering! Thanks for your nice post. I'm glad you are pleased with our ARCH Books. May God be with and bless you and your family richly. Sorry, should have introduced myself. I'm Paul McCain, and I'm the publisher at Concordia Publishing House. Hi! Thanks so much for your post about Arch Books. They've truly been a blessing to many children and families for many years. You can actually check them out right now online with a new e-reader platform we are testing at cph.org. Enjoy! We had quite a few Arch books growing up--and I fondly remember the exaggerated sing-songy iambic pentameter my dad used while reading them out loud to us. I've never heard of these but I'm sure my kids would enjoy them. I'll be on the look-out now. I've never heard of these. I'll have to watch for them now. These were my favorite books when I was a child. They really added a lot to my knowledge, and familiarity of the Bible. Even now when I read certain texts, I can see the illustrations from a much read Arch book in my head. I brought my 4 kids up on these books - supplied by my mother. My youngest is now 32. I still have the books & am still waiting to pass them on to the first child to have a child. My set goes up to Series 18. I wonder if there were any more after that? Does anyone know where I can find a complete list of all the series/titles in case there were more later on?